Urban Archeologist: Flagpole Radio Cafe: Another Great Show This Saturday! 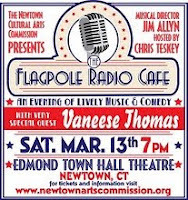 Flagpole Radio Cafe: Another Great Show This Saturday! Hey, it isn't all about me. Just like the things I pick up at sales, I found this local stage show just under a year ago. This is a great local effort and is run by a nice group of folks. The musical special guest is Vaneese Thomas and if you like R&B music, or just watching talented musicians and performers do their stuff, then you couldn't do any better this Saturday night. I'll be there with my camera, I haven't contributed any material to this show, but I have created a blog to display those stills from the last few shows. Go here to see what you've been missing. Click on the Arts Commission link above to buy tickets (all seats are $15).Click on Vaneese Thomas' name to read her bio.